where c is the speed of light in vacuum and v is the phase velocity of light in the medium. For example, the refractive index of water is 1.333, meaning that light travels 1.333 times as fast in vacuum as in water. The refractive index determines how much the path of light is bent, or refracted, when entering a material. This is described by Snell's law of refraction, n1 sinθ1 = n2 sinθ2, where θ1 and θ2 are the angles of incidence and refraction, respectively, of a ray crossing the interface between two media with refractive indices n1 and n2. The refractive indices also determine the amount of light that is reflected when reaching the interface, as well as the critical angle for total internal reflection and Brewster's angle. The refractive index can be seen as the factor by which the speed and the wavelength of the radiation are reduced with respect to their vacuum values: the speed of light in a medium is v = c/n, and similarly the wavelength in that medium is λ = λ0/n, where λ0 is the wavelength of that light in vacuum. This implies that vacuum has a refractive index of 1, and that the frequency (f = v/λ) of the wave is not affected by the refractive index. As a result, the perceived color of the refracted light to a human eye which depends on the frequency is not affected by the refraction or the refractive index of the medium. While the refractive index affects wavelength, it depends on frequency, color and energy so the resulting difference in the bending angle causes white light to split into its constituent colors. This is called dispersion. It can be observed in prisms and rainbows, and chromatic aberration in lenses. Light propagation in absorbing materials can be described using a complex-valued refractive index. The imaginary part then handles the attenuation, while the real part accounts for refraction. The concept of refractive index applies within the full electromagnetic spectrum, from X-rays to radio waves. It can also be applied to wave phenomena such as sound. In this case the speed of sound is used instead of that of light, and a reference medium other than vacuum must be chosen. The phase velocity is the speed at which the crests or the phase of the wave moves, which may be different from the group velocity, the speed at which the pulse of light or the envelope of the wave moves. The definition above is sometimes referred to as the absolute refractive index or the absolute index of refraction to distinguish it from definitions where the speed of light in other reference media than vacuum is used. Historically air at a standardized pressure and temperature has been common as a reference medium. Thomas Young coined the term index of refraction. Thomas Young was presumably the person who first used, and invented, the name "index of refraction", in 1807. At the same time he changed this value of refractive power into a single number, instead of the traditional ratio of two numbers. The ratio had the disadvantage of different appearances. Newton, who called it the "proportion of the sines of incidence and refraction", wrote it as a ratio of two numbers, like "529 to 396" (or "nearly 4 to 3"; for water). Hauksbee, who called it the "ratio of refraction", wrote it as a ratio with a fixed numerator, like "10000 to 7451.9" (for urine). Hutton wrote it as a ratio with a fixed denominator, like 1.3358 to 1 (water). Young did not use a symbol for the index of refraction, in 1807. In the next years, others started using different symbols: n, m, and µ. The symbol n gradually prevailed. Selected refractive indices at λ=589 nm. For references, see the extended List of refractive indices. For visible light most transparent media have refractive indices between 1 and 2. A few examples are given in the adjacent table. These values are measured at the yellow doublet D-line of sodium, with a wavelength of 589 nanometers, as is conventionally done. Gases at atmospheric pressure have refractive indices close to 1 because of their low density. Almost all solids and liquids have refractive indices above 1.3, with aerogel as the clear exception. Aerogel is a very low density solid that can be produced with refractive index in the range from 1.002 to 1.265. 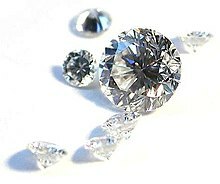 Moissanite lies at the other end of the range with a refractive index as high as 2.65. Most plastics have refractive indices in the range from 1.3 to 1.7, but some high-refractive-index polymers can have values as high as 1.76. For infrared light refractive indices can be considerably higher. Germanium is transparent in the wavelength region from 2 to 14 µm and has a refractive index of about 4. A type of new materials, called topological insulator, was recently found holding higher refractive index of up to 6 in near to mid infrared frequency range. Moreover, topological insulator material are transparent when they have nanoscale thickness. These excellent properties make them a type of significant materials for infrared optics. According to the theory of relativity, no information can travel faster than the speed of light in vacuum, but this does not mean that the refractive index cannot be lower than 1. The refractive index measures the phase velocity of light, which does not carry information. The phase velocity is the speed at which the crests of the wave move and can be faster than the speed of light in vacuum, and thereby give a refractive index below 1. This can occur close to resonance frequencies, for absorbing media, in plasmas, and for X-rays. In the X-ray regime the refractive indices are lower than but very close to 1 (exceptions close to some resonance frequencies). As an example, water has a refractive index of 6999999999740000000♠0.99999974 = 1 − 6993260000000000000♠2.6×10−7 for X-ray radiation at a photon energy of 6985480652946099999♠30 keV (0.04 nm wavelength). An example of a plasma with an index of refraction less than unity is Earth's ionosphere. Since the refractive index of the ionosphere (a plasma), is less than unity, electromagnetic waves propagating through the plasma are bent "away from the normal" (see Geometric optics) allowing the radio wave to be refracted back toward earth, thus enabling long-distance radio communications. See also Radio Propagation and Skywave. Recent research has also demonstrated the existence of materials with a negative refractive index, which can occur if permittivity and permeability have simultaneous negative values. This can be achieved with periodically constructed metamaterials. The resulting negative refraction (i.e., a reversal of Snell's law) offers the possibility of the superlens and other exotic phenomena. At the atomic scale, an electromagnetic wave's phase velocity is slowed in a material because the electric field creates a disturbance in the charges of each atom (primarily the electrons) proportional to the electric susceptibility of the medium. (Similarly, the magnetic field creates a disturbance proportional to the magnetic susceptibility.) As the electromagnetic fields oscillate in the wave, the charges in the material will be "shaken" back and forth at the same frequency. :67 The charges thus radiate their own electromagnetic wave that is at the same frequency, but usually with a phase delay, as the charges may move out of phase with the force driving them (see sinusoidally driven harmonic oscillator). The light wave traveling in the medium is the macroscopic superposition (sum) of all such contributions in the material: the original wave plus the waves radiated by all the moving charges. This wave is typically a wave with the same frequency but shorter wavelength than the original, leading to a slowing of the wave's phase velocity. Most of the radiation from oscillating material charges will modify the incoming wave, changing its velocity. However, some net energy will be radiated in other directions or even at other frequencies (see scattering). If the electrons emit a light wave which is 90° out of phase with the light wave shaking them, it will cause the total light wave to travel slower. This is the normal refraction of transparent materials like glass or water, and corresponds to a refractive index which is real and greater than 1. If the electrons emit a light wave which is 270° out of phase with the light wave shaking them, it will cause the wave to travel faster. This is called "anomalous refraction", and is observed close to absorption lines (typically in infrared spectra), with X-rays in ordinary materials, and with radio waves in Earth's ionosphere. It corresponds to a permittivity less than 1, which causes the refractive index to be also less than unity and the phase velocity of light greater than the speed of light in vacuum c (note that the signal velocity is still less than c, as discussed above). If the response is sufficiently strong and out-of-phase, the result is a negative value of permittivity and imaginary index of refraction, as observed in metals or plasma. 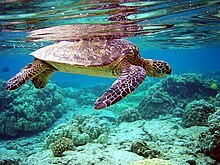 If the electrons emit a light wave which is in phase with the light wave shaking them, it will amplify the light wave. This is rare, but occurs in lasers due to stimulated emission. It corresponds to an imaginary index of refraction, with the opposite sign to that of absorption. For most materials at visible-light frequencies, the phase is somewhere between 90° and 180°, corresponding to a combination of both refraction and absorption. Light of different colors has slightly different refractive indices in water and therefore shows up at different positions in the rainbow. In a prism, dispersion causes different colors to refract at different angles, splitting white light into a rainbow of colors. 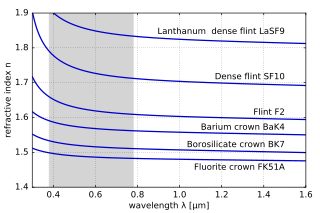 The variation of refractive index with wavelength for various glasses. The shaded zone indicates the range of visible light. The refractive index of materials varies with the wavelength (and frequency) of light. 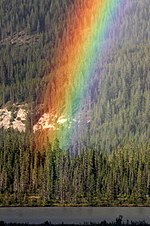 This is called dispersion and causes prisms and rainbows to divide white light into its constituent spectral colors. As the refractive index varies with wavelength, so will the refraction angle as light goes from one material to another. Dispersion also causes the focal length of lenses to be wavelength dependent. This is a type of chromatic aberration, which often needs to be corrected for in imaging systems. In regions of the spectrum where the material does not absorb light, the refractive index tends to decrease with increasing wavelength, and thus increase with frequency. This is called "normal dispersion", in contrast to "anomalous dispersion", where the refractive index increases with wavelength. For visible light normal dispersion means that the refractive index is higher for blue light than for red. For a more accurate description of the wavelength dependence of the refractive index, the Sellmeier equation can be used. It is an empirical formula that works well in describing dispersion. Sellmeier coefficients are often quoted instead of the refractive index in tables. Because of dispersion, it is usually important to specify the vacuum wavelength of light for which a refractive index is measured. Typically, measurements are done at various well-defined spectral emission lines; for example, nD usually denotes the refractive index at the Fraunhofer "D" line, the centre of the yellow sodium double emission at 589.29 nm wavelength. Here we see that κ gives an exponential decay, as expected from the Beer–Lambert law. Since intensity is proportional to the square of the electric field, it will depend on the depth into the material as exp(−4πκz/λ0), and the attenuation coefficient becomes α = 4πκ/λ0. :128 This also relates it to the penetration depth, the distance after which the intensity is reduced by 1/e, δp = 1/α = λ0/(4πκ). Both n and κ are dependent on the frequency. In most circumstances κ > 0 (light is absorbed) or κ = 0 (light travels forever without loss). In special situations, especially in the gain medium of lasers, it is also possible that κ < 0, corresponding to an amplification of the light. An alternative convention uses n = n − iκ instead of n = n + iκ, but where κ > 0 still corresponds to loss. Therefore, these two conventions are inconsistent and should not be confused. The difference is related to defining sinusoidal time dependence as Re[exp(−iωt)] versus Re[exp(+iωt)]. See Mathematical descriptions of opacity. Dielectric loss and non-zero DC conductivity in materials cause absorption. Good dielectric materials such as glass have extremely low DC conductivity, and at low frequencies the dielectric loss is also negligible, resulting in almost no absorption. However, at higher frequencies (such as visible light), dielectric loss may increase absorption significantly, reducing the material's transparency to these frequencies. The real, n, and imaginary, κ, parts of the complex refractive index are related through the Kramers–Kronig relations. In 1986 A.R. Forouhi and I. Bloomer deduced an equation describing κ as a function of photon energy, E, applicable to amorphous materials. Forouhi and Bloomer then applied the Kramers–Kronig relation to derive the corresponding equation for n as a function of E. The same formalism was applied to crystalline materials by Forouhi and Bloomer in 1988. The refractive index and extinction coefficient, n and κ, cannot be measured directly. They must be determined indirectly from measurable quantities that depend on them, such as reflectance, R, or transmittance, T, or ellipsometric parameters, ψ and δ. The determination of n and κ from such measured quantities will involve developing a theoretical expression for R or T, or ψ and δ in terms of a valid physical model for n and κ. By fitting the theoretical model to the measured R or T, or ψ and δ using regression analysis, n and κ can be deduced. typically of the order of 10−5 and 10−6. 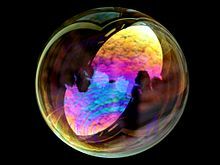 The colors of a soap bubble are determined by the optical path length through the thin soap film in a phenomenon called thin-film interference. 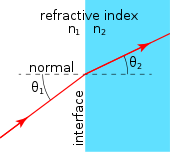 Refraction of light at the interface between two media of different refractive indices, with n2 > n1. Since the phase velocity is lower in the second medium (v2 < v1), the angle of refraction θ2 is less than the angle of incidence θ1; that is, the ray in the higher-index medium is closer to the normal. When light enters a material with higher refractive index, the angle of refraction will be smaller than the angle of incidence and the light will be refracted towards the normal of the surface. The higher the refractive index, the closer to the normal direction the light will travel. When passing into a medium with lower refractive index, the light will instead be refracted away from the normal, towards the surface. The power of a magnifying glass is determined by the shape and refractive index of the lens. where f is the focal length of the lens. is the vacuum wave impedance, μ and ϵ are the absolute permeability and permittivity of the medium, εr is the material's relative permittivity, and μr is its relative permeability. Thus refractive index in a non-magnetic media is the ratio of the vacuum wave impedance to the wave impedance of the medium. In general, the refractive index of a glass increases with its density. However, there does not exist an overall linear relation between the refractive index and the density for all silicate and borosilicate glasses. A relatively high refractive index and low density can be obtained with glasses containing light metal oxides such as Li2O and MgO, while the opposite trend is observed with glasses containing PbO and BaO as seen in the diagram at the right. Many oils (such as olive oil) and ethyl alcohol are examples of liquids which are more refractive, but less dense, than water, contrary to the general correlation between density and refractive index. For gases, n − 1 is proportional to the density of the gas as long as the chemical composition does not change. This means that it is also proportional to the pressure and inversely proportional to the temperature for ideal gases. where λ0 is the wavelength in vacuum. A 2010 study suggested that both equations are correct, with the Abraham version being the kinetic momentum and the Minkowski version being the canonical momentum, and claims to explain the contradicting experimental results using this interpretation. The refractive index of a substance can be related to its polarizability with the Lorentz–Lorenz equation or to the molar refractivities of its constituents by the Gladstone–Dale relation. In atmospheric applications, the refractivity is taken as N = n – 1. Atmospheric refractivity is often expressed as either N = 7006100000000000000♠106(n – 1) or N = 7008100000000000000♠108(n – 1) The multiplication factors are used because the refractive index for air, n deviates from unity by at most a few parts per ten thousand. So far, we have assumed that refraction is given by linear equations involving a spatially constant, scalar refractive index. These assumptions can break down in different ways, to be described in the following subsections. Birefringent materials can give rise to colors when placed between crossed polarizers. This is the basis for photoelasticity. In some materials the refractive index depends on the polarization and propagation direction of the light. This is called birefringence or optical anisotropy. Many crystals are naturally birefringent, but isotropic materials such as plastics and glass can also often be made birefringent by introducing a preferred direction through, e.g., an external force or electric field. This effect is called photoelasticity, and can be used to reveal stresses in structures. The birefringent material is placed between crossed polarizers. A change in birefringence alters the polarization and thereby the fraction of light that is transmitted through the second polarizer. In the more general case of trirefringent materials described by the field of crystal optics, the dielectric constant is a rank-2 tensor (a 3 by 3 matrix). In this case the propagation of light cannot simply be described by refractive indices except for polarizations along principal axes. A gradient-index lens with a parabolic variation of refractive index (n) with radial distance (x). The lens focuses light in the same way as a conventional lens. If the refractive index of a medium is not constant, but varies gradually with position, the material is known as a gradient-index or GRIN medium and is described by gradient index optics. :273 Light traveling through such a medium can be bent or focused, and this effect can be exploited to produce lenses, some optical fibers and other devices. Introducing GRIN elements in the design of an optical system can greatly simplify the system, reducing the number of elements by as much as a third while maintaining overall performance. :276 The crystalline lens of the human eye is an example of a GRIN lens with a refractive index varying from about 1.406 in the inner core to approximately 1.386 at the less dense cortex. :203 Some common mirages are caused by a spatially varying refractive index of air. The refractive index of liquids or solids can be measured with refractometers. They typically measure some angle of refraction or the critical angle for total internal reflection. The first laboratory refractometers sold commercially were developed by Ernst Abbe in the late 19th century. The same principles are still used today. In this instrument a thin layer of the liquid to be measured is placed between two prisms. Light is shone through the liquid at incidence angles all the way up to 90°, i.e., light rays parallel to the surface. The second prism should have an index of refraction higher than that of the liquid, so that light only enters the prism at angles smaller than the critical angle for total reflection. This angle can then be measured either by looking through a telescope,[clarification needed] or with a digital photodetector placed in the focal plane of a lens. The refractive index n of the liquid can then be calculated from the maximum transmission angle θ as n = nG sin θ, where nG is the refractive index of the prism. This type of devices are commonly used in chemical laboratories for identification of substances and for quality control. Handheld variants are used in agriculture by, e.g., wine makers to determine sugar content in grape juice, and inline process refractometers are used in, e.g., chemical and pharmaceutical industry for process control. In gemology a different type of refractometer is used to measure index of refraction and birefringence of gemstones. The gem is placed on a high refractive index prism and illuminated from below. A high refractive index contact liquid is used to achieve optical contact between the gem and the prism. At small incidence angles most of the light will be transmitted into the gem, but at high angles total internal reflection will occur in the prism. The critical angle is normally measured by looking through a telescope. To measure the spatial variation of refractive index in a sample phase-contrast imaging methods are used. These methods measure the variations in phase of the light wave exiting the sample. The phase is proportional to the optical path length the light ray has traversed, and thus gives a measure of the integral of the refractive index along the ray path. The phase cannot be measured directly at optical or higher frequencies, and therefore needs to be converted into intensity by interference with a reference beam. In the visual spectrum this is done using Zernike phase-contrast microscopy, differential interference contrast microscopy (DIC) or interferometry. Zernike phase-contrast microscopy introduces a phase shift to the low spatial frequency components of the image with a phase-shifting annulus in the Fourier plane of the sample, so that high-spatial-frequency parts of the image can interfere with the low-frequency reference beam. In DIC the illumination is split up into two beams that are given different polarizations, are phase shifted differently, and are shifted transversely with slightly different amounts. After the specimen, the two parts are made to interfere, giving an image of the derivative of the optical path length in the direction of the difference in transverse shift. In interferometry the illumination is split up into two beams by a partially reflective mirror. One of the beams is let through the sample before they are combined to interfere and give a direct image of the phase shifts. If the optical path length variations are more than a wavelength the image will contain fringes. There exist several phase-contrast X-ray imaging techniques to determine 2D or 3D spatial distribution of refractive index of samples in the X-ray regime. The refractive index is a very important property of the components of any optical instrument. It determines the focusing power of lenses, the dispersive power of prisms, the reflectivity of lens coatings, and the light-guiding nature of optical fiber. 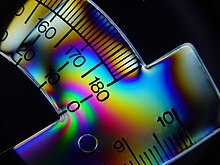 Since refractive index is a fundamental physical property of a substance, it is often used to identify a particular substance, confirm its purity, or measure its concentration. Refractive index is used to measure solids, liquids, and gases. Most commonly it is used to measure the concentration of a solute in an aqueous solution. It can also be used as a useful tool to differentiate between different types of gemstone, due to the unique chatoyance each individual stone displays. 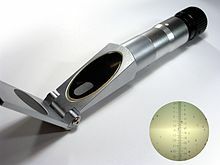 A refractometer is the instrument used to measure refractive index. For a solution of sugar, the refractive index can be used to determine the sugar content (see Brix). ^ a b c d e f g h i j k l m n o p q r s Hecht, Eugene (2002). Optics. Addison-Wesley. ISBN 978-0-321-18878-6. ^ a b Attwood, David (1999). Soft X-rays and extreme ultraviolet radiation: principles and applications. p. 60. ISBN 978-0-521-02997-1. ^ Kinsler, Lawrence E. (2000). Fundamentals of Acoustics. John Wiley. p. 136. ISBN 978-0-471-84789-2. ^ Young, Thomas (1807). A course of lectures on natural philosophy and the mechanical arts. p. 413. Archived from the original on 2017-02-22. ^ Newton, Isaac (1730). Opticks: Or, A Treatise of the Reflections, Refractions, Inflections and Colours of Light. p. 247. Archived from the original on 2015-11-28. ^ Hauksbee, Francis (1710). "A Description of the Apparatus for Making Experiments on the Refractions of Fluids". Philosophical Transactions of the Royal Society of London. 27 (325–336): 207. doi:10.1098/rstl.1710.0015. ^ Hutton, Charles (1795). Philosophical and mathematical dictionary. p. 299. Archived from the original on 2017-02-22. ^ Brewster, David (1815). "On the structure of doubly refracting crystals". Philosophical Magazine. 45 (202): 126. doi:10.1080/14786441508638398. Archived from the original on 2017-02-22. ^ Herschel, John F.W. (1828). On the Theory of Light. p. 368. Archived from the original on 2015-11-24. ^ Malitson (1965). "Refractive Index Database". refractiveindex.info. Retrieved June 20, 2018. ^ Faick, C.A. ; Finn, A.N. (July 1931). "The Index of Refraction of Some Soda-Lime-Silica Glasses as a Function of the Composition" (.pdf). National Institute of Standards and Technology. Archived (PDF) from the original on December 30, 2016. Retrieved 11 December 2016. ^ Sultanova, N.; Kasarova, S.; Nikolov, I. (October 2009). "Dispersion Properties of Optical Polymers". Acta Physica Polonica A. 116 (4): 585–587. 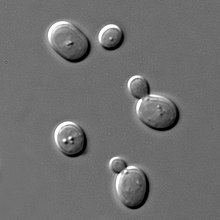 doi:10.12693/APhysPolA.116.585. ^ Tapping, J.; Reilly, M. L. (1 May 1986). "Index of refraction of sapphire between 24 and 1060°C for wavelengths of 633 and 799 nm". Journal of the Optical Society of America A. 3 (5): 610. Bibcode:1986JOSAA...3..610T. doi:10.1364/JOSAA.3.000610. Archived from the original on 20 December 2016. Retrieved 20 December 2016. ^ a b "Forensic Science Communications, Glass Refractive Index Determination". FBI Laboratory Services. Archived from the original on 2014-09-10. Retrieved 2014-09-08. ^ Tabata, M.; et al. (2005). "Development of Silica Aerogel with Any Density" (PDF). 2005 IEEE Nuclear Science Symposium Conference Record. 2: 816–818. doi:10.1109/NSSMIC.2005.1596380. ISBN 978-0-7803-9221-2. Archived (PDF) from the original on 2013-05-18. ^ Yue, Zengji; Cai, Boyuan; Wang, Lan; Wang, Xiaolin; Gu, Min (2016-03-01). "Intrinsically core-shell plasmonic dielectric nanostructures with ultrahigh refractive index". Science Advances. 2 (3): e1501536. Bibcode:2016SciA....2E1536Y. doi:10.1126/sciadv.1501536. ISSN 2375-2548. PMC 4820380. PMID 27051869. Archived from the original on 2017-09-09. ^ Als-Nielsen, J.; McMorrow, D. (2011). Elements of Modern X-ray Physics. Wiley-VCH. p. 25. ISBN 978-0-470-97395-0. One consequence of the real part of n being less than unity is that it implies that the phase velocity inside the material, c/n, is larger than the velocity of light, c. This does not, however, violate the law of relativity, which requires that only signals carrying information do not travel faster than c. Such signals move with the group velocity, not with the phase velocity, and it can be shown that the group velocity is in fact less than c.
^ a b "X-Ray Interactions With Matter". The Center for X-Ray Optics. Archived from the original on 2011-08-27. Retrieved 2011-08-30. ^ Lied, Finn (1967). High Frequency Radio Communications with Emphasis on Polar Problems. The Advisory Group for Aerospace Research and Development. pp. 1–7. ^ Veselago, V. G. (1968). "The electrodynamics of substances with simultaneously negative values of ε and μ". Soviet Physics Uspekhi. 10 (4): 509–514. Bibcode:1968SvPhU..10..509V. doi:10.1070/PU1968v010n04ABEH003699. ^ Shalaev, V. M. (2007). 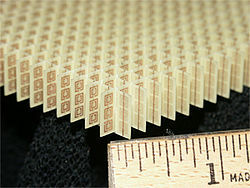 "Optical negative-index metamaterials". Nature Photonics. 1: 41–48. Bibcode:2007NaPho...1...41S. doi:10.1038/nphoton.2006.49. Archived from the original on 2011-06-29. Retrieved 2014-09-07. ^ a b Feynman, Richard P. (2011). Feynman Lectures on Physics 1: Mainly Mechanics, Radiation, and Heat. Basic Books. ISBN 978-0-465-02493-3. ^ Dresselhaus, M. S. (1999). "Solid State Physics Part II Optical Properties of Solids" (PDF). Course 6.732 Solid State Physics. MIT. Archived (PDF) from the original on 2015-07-24. Retrieved 2015-01-05. ^ a b c d Born, Max; Wolf, Emil (1999). Principles of Optics (7th expanded ed.). ISBN 978-0-521-78449-8. Archived from the original on 2017-02-22. ^ Swenson, Jim; Incorporates Public Domain material from the U.S. Department of Energy (November 10, 2009). "Refractive Index of Minerals". Newton BBS, Argonne National Laboratory, US DOE. Archived from the original on May 28, 2010. Retrieved 2010-07-28. ^ a b c Carlsson, Kjell (2007). "Light microscopy" (PDF). Archived (PDF) from the original on 2015-04-02. Retrieved 2015-01-02. ^ Bleaney, B.; Bleaney, B.I. (1976). Electricity and Magnetism (Third ed.). Oxford University Press. ISBN 978-0-19-851141-0. ^ "Calculation of the Refractive Index of Glasses". Statistical Calculation and Development of Glass Properties. Archived from the original on 2007-10-15. ^ Stone, Jack A.; Zimmerman, Jay H. (2011-12-28). "Index of refraction of air". Engineering metrology toolbox. National Institute of Standards and Technology (NIST). Archived from the original on 2014-01-11. Retrieved 2014-01-11. ^ Bor, Z.; Osvay, K.; Rácz, B.; Szabó, G. (1990). "Group refractive index measurement by Michelson interferometer". Optics Communications. 78 (2): 109–112. Bibcode:1990OptCo..78..109B. doi:10.1016/0030-4018(90)90104-2. ^ Minkowski, Hermann (1908). "Die Grundgleichung für die elektromagnetischen Vorgänge in bewegten Körpern". Nachrichten von der Gesellschaft der Wissenschaften zu Göttingen, Mathematisch-Physikalische Klasse. 1908 (1): 53–111. ^ Abraham, Max (1909). "Zur Elektrodynamik bewegter Körper". Rendiconti del Circolo Matematico di Palermo. 28 (1). ^ Barnett, Stephen (2010-02-07). "Resolution of the Abraham-Minkowski Dilemma" (PDF). Phys. Rev. Lett. 104 (7): 070401. Bibcode:2010PhRvL.104g0401B. doi:10.1103/PhysRevLett.104.070401. PMID 20366861. ^ Aparicio, Josep M.; Laroche, Stéphane (2011-06-02). "An evaluation of the expression of the atmospheric refractivity for GPS signals". Journal of Geophysical Research. 116 (D11): D11104. Bibcode:2011JGRD..11611104A. doi:10.1029/2010JD015214. ^ "The Evolution of the Abbe Refractometer". Humboldt State University, Richard A. Paselk. 1998. Archived from the original on 2011-06-12. Retrieved 2011-09-03. ^ "Refractometers and refractometry". Refractometer.pl. 2011. Archived from the original on 2011-10-20. Retrieved 2011-09-03. ^ "Refractometer". The Gemology Project. Archived from the original on 2011-09-10. Retrieved 2011-09-03. ^ Fitzgerald, Richard (July 2000). "Phase‐Sensitive X‐Ray Imaging". Physics Today. 53 (7): 23. Bibcode:2000PhT....53g..23F. doi:10.1063/1.1292471.